Hi, my name’s Martin, I got “N” on my Roman wedding finger to show my fiancee Natalie how much I love her, and how much faith I have in our relationship. We’re both students at the moment and when we finish studying the wedding will be on… We’ve already been together 8 years, engaged for 7! It’s Ben here, I sent you the hour glass and coffin thumb tattoos. 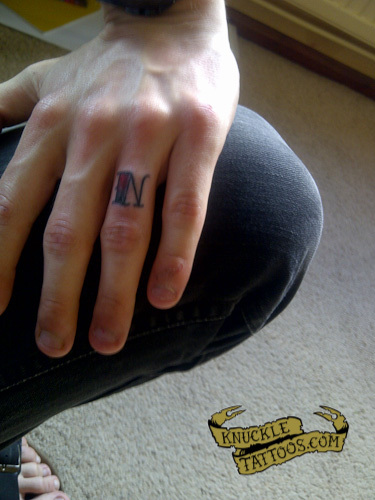 Well I’ve got my knuckles for you now, hope you like. If you’ve had a bad day, you can allways rely on a nice brew to ease the pain. This is just how I take my tea. Tattoos by Troy Bond at Phil Bonds Tattoo Studio, Torquay UK.